Smart Technology for Aging, Disability, and Independence: The State of the Science brings together current research and technological developments from engineering, computer science, and the rehabilitation sciences, detailing how its applications can promote continuing independence for older persons and those with disabilities. 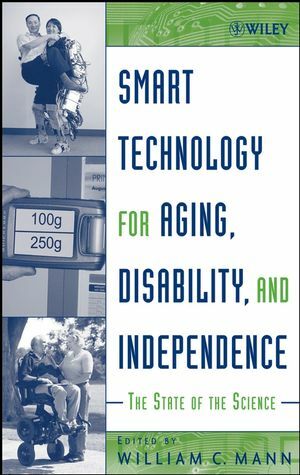 After considering specific high-technology solutions, the text examines recent trends in other critical areas, such as basic assistive technologies, driving, transportation and community mobility, home modifications and design, and changing standards of elder care. Students and professionals in the rehabilitation sciences, health care providers, researchers in computer science and engineering, and non-expert readers will all appreciate this text's thorough coverage and clear presentation of the state of the science. WILLIAM C. MANN, OTR, PhD, is Professor and Chair of the Department of Occupational Therapy and Director of the Rehabilitation Science Doctoral Program at the University of Florida. His research focus is on aging and disability, with an emphasis on compensatory strategies to maintain and promote independence. Since 1991, he has served as Principal Investigator for the NIDRR-funded Rehabilitation Engineering Research Center on Aging. In the past fifteen years, Dr. Mann has authored more that 100 articles and book chapters on assistive technology, two books on assistive technology, and founded and served as editor of the journal Technology and Disability from 1990 to 2000. As an expert on aging and disability, Dr. Mann is a frequent lecturer at local, national, and international conferences and symposiums. Prior to his move to the University of Florida in 2000, Dr. Mann served as professor and chair of occupational therapy at the University of Buffalo, where he developed a curriculum in rehabilitation technology, and also established and directed the internationally recognized Center for Assistive Technology. Chapter 1. Aging, Disability, and Independence: Trends and Perspectives. PART I: SMART TECHNOLOGY FOR AGING, DISABIITY AND INDEPENDENCE. Chapter 2. Home Automation and Smart Environments to Support Independence. Chapter 4. Other Devices and High Technology Solutions. PART II. RELATED ASPECTS OF AGING, DISABILITY AND INDEPENDENCE. Chapter 6. Basic Assistive Technology. Chapter 7. Elder Drivers and Technology. Chapter 8. Transportation and Community Mobility. Chapter 9. Home Modifications and Universal Design. Chapter 10. Injury Prevention and Health Promotion.